HRZone has a range of books available for review. If you would like to receive one of our business books, free of charge, please contact the editor on editor at hrzone dot com and we can send you a list of what's available. In return, we ask for a 400-700 word review of the book, its content and whether it's appropriate for a senior HR director audience and for business professionals looking to become more effective in their roles. ‘Who Can you Trust?’ is a brilliant book Rachel Botsman simultaneously explains, explores and unnerves. As a librarian I’d be hard-pressed to decide whether to categorise this as textbook, sci fi or thriller - it is all. The subject is both technology and trust. The story is how a digital era has brought fundamental changes and challenges to who and how we trust and the consequences when we do and don’t. Botsman explains that before the advent of major, centralised trust institutions – banking systems and state-issued ‘fiat’ currencies, industry regulators, trademarks and authorities – trust was local and community-based. Local trust then shifted to an institutional trust. Technology has brought us together by allowing a second ‘trust leap’ to distributed trust. Distributed trust removes the middle-man and replaces the authority figure of a leader, expert or organisation with a platform. Platforms like Uber, Airbnb, Amazon, Tripadvisor and even BThFacebook pages create the opportunity for each person to establish trust in something with access to validating views from a much wider pool of connections and pre-built recommendation power. How we know if something is good, bad or ugly is a decision we can distribute via the tech. After understanding the academics in chapter one, prepare to be shocked at a battery of beatings our trust has taken first in the institutions. The US government met a ‘moral and ethical nightmare’ with the Tuskegee scandal by deliberately infecting unwitting black Americans. The bankers behind the rash risk-taking that plunged us into the financial crisis of 2008 likewise created an irredeemable trust breach. In the UK, we lost faith in our leaders with weapons of mass destruction. Arguably, the author provokes, this disintegration of institutional trust is why Hilary Clinton is not the current US president. The rise of the e-commerce site Alibaba is cited first as a example of how rapidly one bright idea overcame a human trust barrier (hence the phrase ‘trust leap’) to persuade people to exchange goods and money without even meeting a person. We jump in cars with strangers because the app told us they were our Uber driver. Once upon a time, we never thought we would do these things. But Botsman does not leave us beyond the second or third chapter to hear the horror stories. First she explores some of the less logical ways in which our trust works - we look for things that are strangely familiar. For example, if my chatbot starts our interaction with “Hey Kate!”, rather than “Addressing employee ID 60845”, then I’m more relaxed (it’s one reason why we like emoticons). As an expert in HR technology I often notice the difficulty Brits have with systems that fail to translate subtle Americanisms. Before we knew that all Facebook users are (at any time) subject to data experiment as part of at least one research project by the platform, we were happier with it. This despite the echo chambers of bias built by a platform which promotes our friends’ views above others. 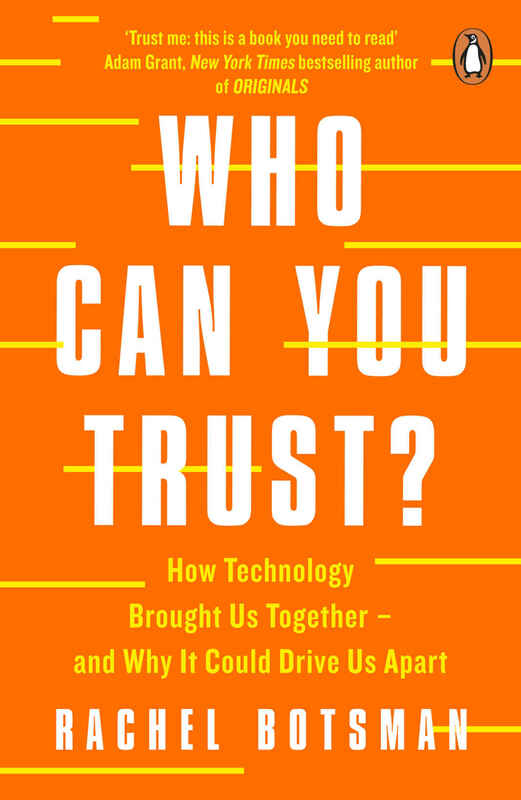 ‘Who Can You Trust?’ is a fascinating insight into how and why we should question what sits behind the programming: fake news, calamitous recommendations and online matches, data leaks, data exploitations. And we still want an authority figure to blame - the answer is, of course, a human. One is the lack of attention given to the implications of distributed trust societies on the world of work. What does her tale mean for the gig economy? What does it mean for employee value propositions? Does it explain the moves we see LinkedIn making into the sourcing of talent? What about HR technology and its place to protect the trust between employee and employer? Secondly, I am alarmed at a lack of rationale for us to feel happy that there are boundless opportunities for blockchain to do good in the Western world and yet it is appalled by the actions of the Chinese state. You will be sickened by the Chinese government scheme for a ‘citizen score’ to govern with a single figure your chances of securing finance, education, healthcare and so on. The clandestine massive use of big data and of decision-making by code on our behalf is hardly different. If Clinton did indeed suffer for representing a distrusted institution, then her conqueror has one habit which here rings true: he tends to talk/tweet about goodies and baddies in this world. The goodies use platforms based on distributed trust to reach out to small traders in India or in Kenya with business loans. The baddies plunder legitimate cryptocurrency funds or smatter our social feeds with fake news. I take away from the book therefore a vision of some kind of unimaginably efficient dystopia. A final section is wonderfully helpful if you wish to get to grips with how blockchain technology could apply. I learnt about how the Ethereum blockchain offers three types of possibility: to transfer assets, to verify supply chain and to govern ‘smart contracts’. No, it’s not all about bitcoin. The book is worth a read for these two closing chapters alone. History proves a series of trust calamities. Technology has given us new hope for trust. ‘Every act of creation is first an act of destruction’, the author cites of Picasso. Currently we are sat in a tricky trust gap where we don’t quite understand the next possibilities. ‘Who Can We Trust?’ purports to reassure but does not and I think that is quite deliberate. Kate is the Director of Insights at Phase 3 Consulting, independent specialists in people technology in the UK. Her passion at work is for bridging the gap between technology and people at work, translating for HR professionals the language of HR systems and making meaningful their potential. She believes that success with people technology is through people and that people are the differentiator. Using simple techniques drawn from HR experience, project management, business psychology and analogy with everyday life, Kate presents and explains how to work well with technology and technology projects in an HR leadership role. With a background in contrasting private and public sector HR management, Kate developed her thinking in seeking for herself to understand her first HR systems project-work. She led Phase 3 as Managing Director before choosing to focus on offering ‘Insights’, through writing and speaking engagements, talent development in HR tech and the continuing development of new industry ideas. Kate’s guiding principle is that openness offers knowledge-sharing, credibility and trust, best delivered with incorrigible enthusiasm.